Written by Phil Whitting on 24th October 2018 . 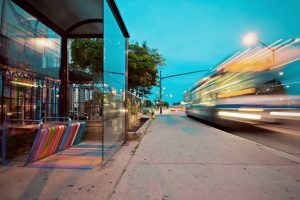 In these fast-moving, highly-connected times, bus customers expect accurate real time information at their fingertips. 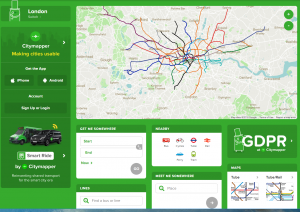 For example, the Citymapper App helps to get you around London with ease ………. Modern passenger busses carry GPS satellite navigation systems to give their exact location at all times. The on-board system transmits its location data to a central computer. In turn, the computer communicates the information to passengers via an array of interfaces. Visual displays at bus stops show arrival times, service updates and delays. Bus company websites provide similar information for website users. Most bus companies and some independent service providers present the information via iOS and Android apps. When inside underground bus stations / terminals, busses cannot receive a live GPS signal. As a result, Real Time Information (RTI) systems are not updated and passengers receive inaccurate timetable information. It continues to transmit location data to the central computer via its mobile communications system. However, this is no longer real-time. The location information now comprises the coordinates of the place where it last had sky-view, just before it entered the underground bus station. In effect, the system transmits stale information when the bus leaves the terminal until it receives live GPS signals again. There are two additional issues that may affect the time it takes for a bus to be fully online and sending real time information again. If it has been underground for say an hour, the satellites that the bus was receiving signal from have moved on to another section of their orbit. The GPS receiver would have to download location information of the satellites that are now visible which can take up to 15 minutes, especially in urban canyons. The bus is out of sync with the satellites. Satellite navigation equipment in busses is ‘locked-on’ to the GPS signal at all times when underground. When busses are underground they continue to receive live GPS signals and will send real-time information to central computer systems. When busses leave the station, there is zero satellite acquisition delay, hence no gap in service. What does this mean to bus customers? They have a better experience of the bus company as travellers always say that they want to be kept up to date on arrival times etc. Increasingly, bus information is being fed into apps which revolve around timely information. A modest investment in this area delivers improved service quality based on reliability, punctuality, real-time availability of timetable information including incidents affecting the service, and shorter waiting times at bus stops.